Starting a blog is a bit awkward, I mean, where do you really begin? The first post was the much-requested no-hassle sock pattern, which was why I started the blog in the first place. I was tired of sending it out by email and private messages. I am a book compositor by profession, and it just so happens that one of the books I am currently laying out is about blogs. It's one of the few books that I actually started reading (usually I just look at the layout and ignore the content). I had to stop compositing and finish reading, because the text was getting kinda raggedy. But the book was so interesting that I began following the author's directions. I tried a few of his recommended blogging sites, and decided Blogger was the easiest to use. I am sure that after a few months or so, the posts will die down to a trickle, but there is a good amount of backlog here, and many people have requested pictures and tutorials from me. So I set up my camera on a tripod, and will try to fill everyone's wish list (even Laura, who wants some pictures that belong in the late--and-much-lamented You Knit What!). So, for the first real post, I present a wildly condensed knitting history, featuring only my earliest and latest finished objects. I learned to knit when I was two years old. We lived in New York City and getting around in those days meant using the subway. Whenever my mother took me down into that appalling, noisy, black hole, I would start to scream. She, being an impatient person, decided that all the little brat needed was a distraction. So out came the knitting needles and some red yarn, and I apparently spent two years knitting a pot holder. "Apparently," because no pot holder was ever produced that I could recall. About ten years ago I asked her about it, and she told me that she unravelled the darn thing after each knitting session, seeing as how (a) she had no use for a woolen potholder and (b) if I finished it, I'd probably start the screaming bit all over again. At some point, we became affluent enough to take taxis, so the pot holder remains my first unfinished object. 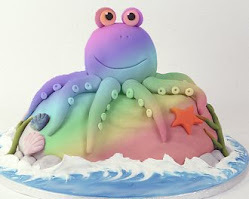 I have no desire to recreate it. RIP. 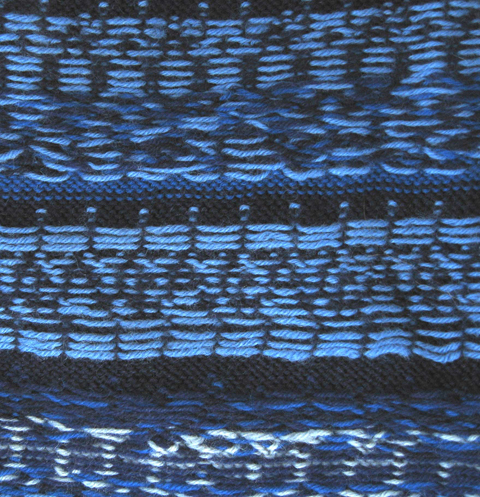 After that, we progressed to scarves (long since disintegrated) and other forgotten knitware. 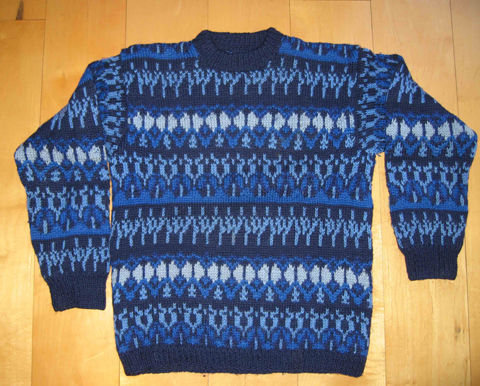 However, at the age of eight, I made my first sweater. I still have it and I still wear it, as she had me make it in a lady's size Small, so that I wouldn't outgrow it (all the women in my family are tiny). Here;s a close-up--hard to believe that I was knitting with one color in each hand at that age. And here's a close-up of the inside. Not bad, even 50 years later. As she always was, she was correct about the sizing. It still fits, 50 years later. She purchased the yarn and pattern from a shop in Denmark. 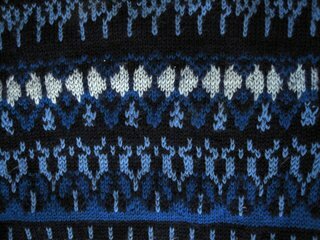 It was knitted entirely in the round up to the armholes on a ghastly circular needle, then the front and back were knit back and forth on even more ghastly straight needles. 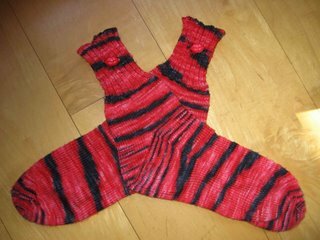 The shoulders were seamed and the sleeve stitches were picked up around the armholes and knitted down to the cuffs. A daring design for 1958, when almost everything was knitted flat and tediously seamed together. I can still see her face when I cast off the last stitch and the sweater fell to the floor. Mother wasn't much on verbal expression, and her praise was rare. She picked up the sweater and turned it inside out, then showed me how to weave in the ends. Never did she block anything, so a little while later, I found myself outside in the snow wearing my brand-new sweater, which at that point, came down below my knees. Nice and warm. When I came back inside, she had piles of Workbasket Magazine ready for me to choose my next project. I have no idea what it was, though. When I get around to going through my drawers, I will post pictures of some other antique FO's that I kept. In the meantime, here is my latest FO: Little Devil Kissy Socks. The yarn is Lisa Souza's lucious Merino Sock Little Devil colorway. Pattern is the No-Hassle sock from the last post. DH (size 12) loves them and as worn them constantly for the last few weeks. I had to fish them out of the laundry bag to take a picture, so they look a bit rumpled. The JHB buttons are just sweet. 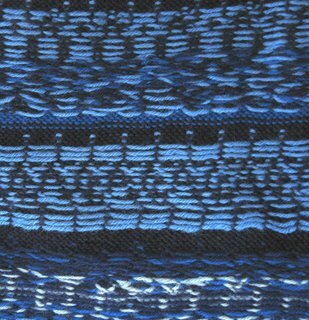 I bought some of the cheshire cats to use on a sweater that is currently almost in progress (still swatching). The yarn is Lisa Souza's Alpaca Silk in the Wild Things colorway, also lucious. Lisa Lucious Souza, that's her. Check her out via the link in the sidebar on the right of this blog page. Sometime during the next few weeks I will add lots of pictures to my sock tutorial. 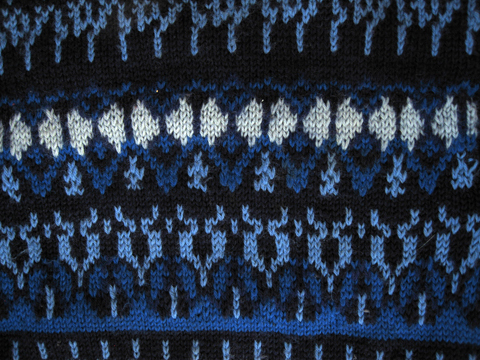 it's not so easy to take pictures of knitting-in-progress, so bear with me for a bit. Ahhhhhhh, welcome to the blog land. Listen, if you could make that sweater, that beautifully spectacular sweater at EIGHT, no wonder you can ponder all of these wonderful projects, Miz Fleegle. Does your hubby like to flash his fabulous socks? The lip buttons just the right touch, to be sure. Thanks for sharing them. Look out, I am going to link you to my blog! DH is ectstatic to be released from black Thorlos. 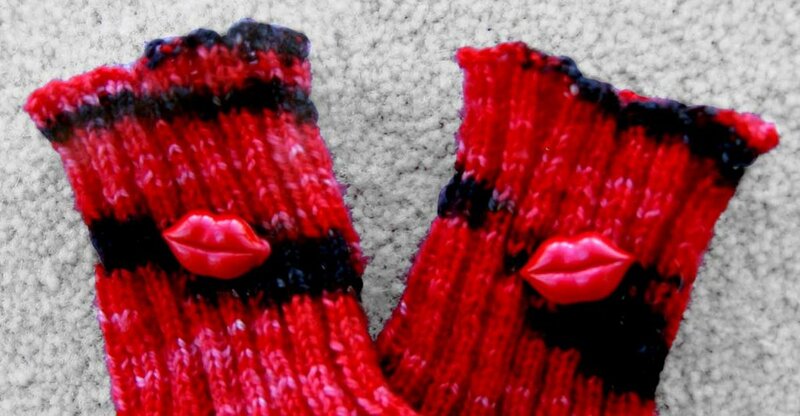 Wait until I post the eye-sizzling Socks That Rock, complete with bobbles. You are a genius, Ms. Fleegle! You knit this at the age of 8?! I'm so proud to be your first student in Japan. What's this all about, anyway?